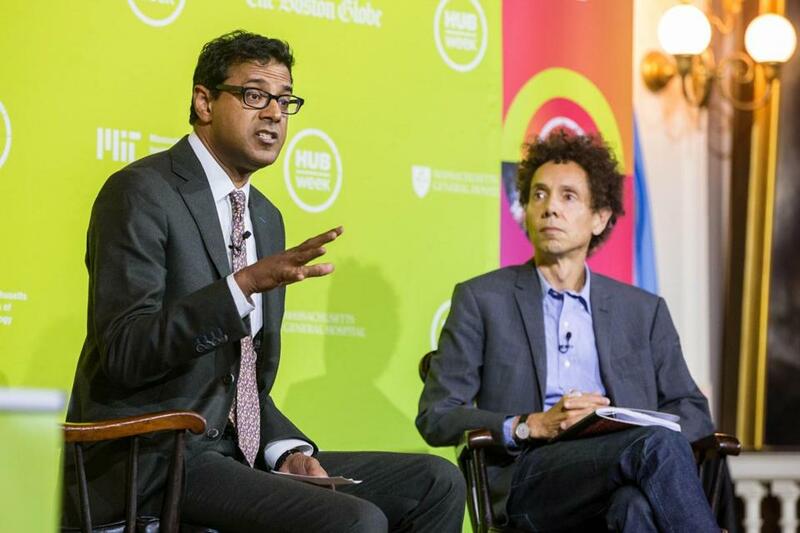 Author Malcolm Gladwell (right) listened to Dr. Atul Gawande at Faneuil Hall Friday during a HUBweek event. Every day, health care professionals schooled in cutting-edge medical techniques make critical decisions that save millions of lives. They also make simple mistakes that can just as easily end them. That dichotomy has long unsettled Atul Gawande, a surgeon at Brigham and Women’s Hospital and professor at the Harvard School of Public Health, and it’s one that he’s routinely tackled in his books and articles for The New Yorker magazine. On Friday, he was joined by his New Yorker colleague, best-selling author Malcolm Gladwell, for a wide-ranging conversation about rethinking health care, and introducing innovative systems to help save more lives. The conversation at Faneuil Hall was part of HUBweek, an ideas festival founded by Harvard, MIT, Massachusetts General Hospital, and The Boston Globe. Despite the rush to find new and innovative ways to save patients, the medical profession must also ensure that basic medical protocols are followed, Gawande said. “The extreme complexity of modern medicine has exceeded our ability to handle it,” he said. Fortunately, he has found a rather simple solution: A checklist. Research has shown that introducing a checklist for surgeons to review before starting a procedure dramatically cuts down on post-surgical deaths, he said. Gawande has helped codify and expand these ideas through his work as the executive director of Ariadne Labs, a group devoted to finding health system innovations that can help simplify modern medicine. The goal, he said, has been to create a new kind of science, one that defines where failures occur, where complexities overwhelm teams, and finds prototypes to fix these problems. In South Carolina, hospitals that implemented the lab’s Safe Surgery Checklist had a 22 percent decrease in post-operative mortality, he said. Ariadne’s efforts also focus on securing better outcomes for mothers during birth, as well as helping doctors to improve end-of-life planning for patients. New procedures to improve care for seriously ill patients have been implemented in nine countries, 27 states, 80 institutions, and 50 health systems. Several times during their talk, Gladwell, known for his books “The Tipping Point,” “Blink,” and others, sought to provoke Gawande into explaining why health care is less innovative than other industries. He compared medicine to sports, noting Patriot’s coach Bill Belichick’s propensity for staging intricate plays. “This is the rare case where football players appear to be smarter than physicians,” he quipped. Gladwell also asked how to shift cultural perceptions within health care. If everyone is trying to be the hero, he argued, than no one is focusing on doing the daily work of preventative care. “The death that didn’t happen is not visible,” Gawande said. Retraining physicians to be more team-oriented and collaborative will help change outcomes. And getting a new generation of researchers interested in implementing health care systems, rather than discovering new drugs, will be his biggest challenge.